Car detailing,paint correction and paint protection for cars however Is Dr Buff’s no 1 Priority and we are known for being the best in our services. Being certified by one the world’s industry leaders in car detailing products ensures that you get professional results all the time without fail. We are certified by Meguiars as professional end detailers in providing results. All our cars are serviced from the same location. We don’t take photos of vehcles on a driveway or some show piece work at a car show and claim to be our detail or paint correction servicing. We could if we wanted to, we just choose not to because we legitimately care about our reputation. Our services are that good we often find other detailing services using our images on their own sites. Having been known as one of the best in paint correction and paint protection services in Sydney, we can certainly provide you with your needs in maintaining your car’s appearance. We are the professionals in removing scratches or swirl marks from your car paint that have been inflicted by repetitive use of a hand car wash or various car washes. Car wash servicing can inflict severe damage to painted surfaces. Not only scratches but long term damage that will result in a respray or selling your vehicle due to the cost to restore scratched, swirled or badly faded surfaces. Most people leave this till it is too late.If you’ve been using a car wash. cheap detailing services or any type of car wash, be it mechanical like that of service station car washes or even a jetwash in your local area, you will have some level of damage to your paint in terms of scratches all over paint or swirl marks with paint fade. Deal with a Professional Meguiars Car Detailer for the best possible results in your car detailing, paint correction, or paint protection needs. Professional detailing services provide results that leave one in awe of the appearance of their car. Especially after having restored damaged surfaces from car wash damage. Why ? Because there is a difference between a one hour cheap detail as opposed to a eight or ten hour paint correction process or even detailing. We are also not mobile detailers to the likes of mobile detailers that for instance service car dealers. If our customers travel to us at Campbelltown from all over Sydney, then that must say something about our services. Vehicle paint restoration experts who have passion are professional detailers with a difference. From a Subaru WRX to a Datsun 120y to a classic Mustang, just give us a call and see what we can do for you. 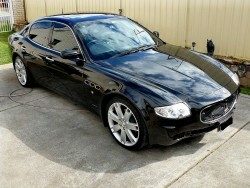 Our professional end paint correction services will drop your jaw when it comes to depth of colour and glass finishes. It is obvious that if you are looking at our website that are obviously looking for a serious professional. Well you can’t get more serious than a car detailer who teaches paint correction to trainees wishing to expand in their industry. Talking about paint protection for new cars or even used cars, if you are buying a new car and would like to protect your car paint, don’t buy dealer paint protection, buy aftermarket paint protection for your new car. You will save about 1000 dollars on average and also buy paint protection or hard paint sealers that is a lot better suited as professional or prestige detailers often do provide recognized brands. New car paint protection is not necessarily cheap but it is needed in order to protect newly painted surfaces on new cars or even used cars. We can provide new car paint protection any time should you need it. If you really want to protect your new car paint, the best new car paint protection is Toughseal, Gloss Coat or, Opticoat paint protection packages. It really is the best paint protection on new cars today with a wide market of vehicles from classics to general to prestige cars using these paint protection packages on new or used cars. If you want to protect your car paint, give Dr Buff a call today.